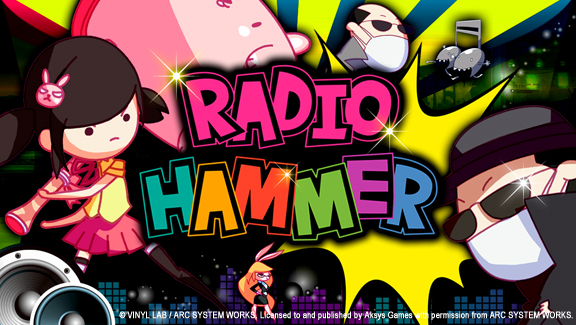 RadioHammer is a simple rhythm game that first appeared on mobile devices. Aksys Games has brought over the 3DS version of the game, and I’m always up to try out a new rhythm game. Is this game fun, or does it lack depth like most mobile titles? Let’s find out. The story begins with a popular radio station providing some of the most groovy tunes around from the hottest DJs on Earth. This is all just a cover however, for this radio station is fighting for justice! It brings the beats that will destroy evil and bring peace to world. That is the general story of game, however each DJ has their own story to tell and we’ll get to that a bit further down in the review. Bad guys always messing up your groove! 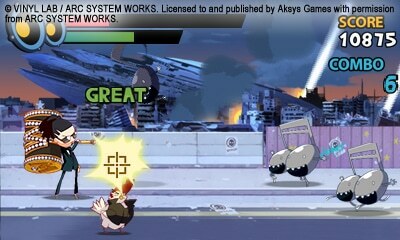 The game features some nice stylized pixel art, which you have seen in other Arc System Works titles such as Phantom Breaker: Battlegrounds. Though I would call most of the presentation minimal, the sprites are very colorful, bright and look great on the 3DS screen. I really loved the character sprites, as each of DJs has a distinct look and it was a nice touch to include Celia from Chaos Code as a bonus character. There is no 3D support for this title, which is really a shame since it works with two planes and it would have been great to show depth. The meat of a rhythm game is the music. 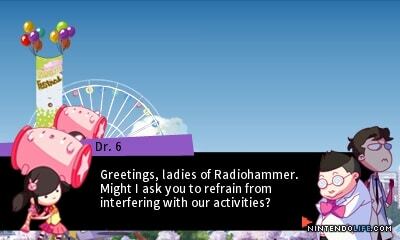 Thankfully RadioHammer delivers in this department. There are over 50 tracks sporting a wide variety of styles, from Pop Rock to Reggae, and even some Disco, there is something in there for everyone to enjoy. You’ll find yourself tapping or humming along with beats even on the menu screens. Who’s up for a game of Whack A Perv! Gameplay is pretty simple compared to other rhythm games I’ve played. Your character will stand on the left side of screen while enemies run towards you from the right. They will either be running at you from the top or bottom plane, and when they get close enough to the cross-hair on screen you will simply tap in that direction to whack them away. There are plenty of control options here, you can use the touchscreen, the face buttons, or the d-pad. I found that they all work pretty well so it’s really up to your personal preference. There are a few different play modes to choose from here. Story Mode will send you through 15 stages of fun with each of the DJs. These stories are pretty crazy, but quite humorous. From Julie Ann smacking away perverts with her giant hammer, to Simply Lita fighting off a zombie invasion, I really enjoyed these crazy tales. I also thought it was interesting to have a boss battle at the end of each character’s story. Ever wanted to destroy a giant alien ship with music notes? Well, now’s your chance to do so. In addition to Story Mode there is also Extra Mode, which lets you replay Story Mode levels at a higher difficulty, Random Play that lets you play tracks at random, and Jukebox Mode that allows you to enjoy the game tunes at any time. There are also plenty of in-game trophies to unlock to keep you busy. Not gonna say what these look like, but you know..
Like all other rhythm games you will be graded on how close to the center of the cross-hair you hit your foes. You will be scored either Good, Great, or Perfect, and each of these will also produce a different sound. I thought that was really nice since it let you know by ear if you were on the beat or not. If an enemy gets through your cross-hair you will take some damage off your life bar, but you can regain energy from the random presents that appear. Just simply tap the Y button or hit left D-pad to snag them up. However some of these presents are traps and can cause you to lose even more health or damage your Fever Meter. That meter is located just under the life bar. This will fill as you smash your foes, and when it is full you will enter fever mode which makes getting Perfect hits much easier. Though this one is simple and you will finish off Story Mode pretty quickly, in around 4 or 5 hours, I have to say I had a lot of fun with this title. Its quirky style and tons of great music hooked me and I couldn’t put it down. I found myself replaying tracks over and over to get a better score and unlock trophies. Though some will find it too simple, for the $5.99 price tag you’d be hard pressed to find another rhythm game that would deliver this much fun and entertainment. Game was provided by the publisher for review purposes.